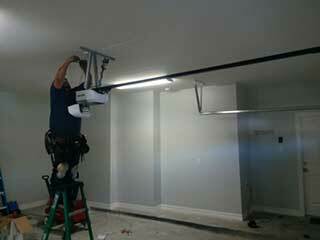 The opener is the most important part of your overhead door system. It controls the door’s movement, and must work perfectly in order to keep your garage door working safely and reliably. It’s a complicated machine, though, and there’s a lot that can go wrong with it; the drive system can become damaged, chains can break, belts can tear. The unit's internal motor gear can also wear out or break, and its different electrical component can experience a variety of malfunctions. Even the safety sensors may require realignment. Whatever the case may be, our technicians can quickly find and fix any of these problems, as well as many others, and ensure that your opener is working properly day in and day out. In addition to fixing problems with your existing opener, our technicians also have the expertise and experience required to install new units. Whether you’re looking for a Genie belt-drive opener or a screw-drive LiftMaster model, we will be able to give you expert guidance during the buying process and perform the opener installation for you once you've made your decision. We'll make sure the device is perfectly set up and able to function without any issues from day one. Which Drive System Do I Need? The biggest difference between opener models, aside from various special features their manufacturer's offer, is usually the drive system they use. There are three different ones you can choose from, and since they will determine a lot about this unit, this needs to be your first decision. Firstly, there are chain drive opener models - these are the oldest and the most commonly used type. They are affordable and reliable, but also very noisy. Screw drive units are a little quieter (though by no means silent) and they have the additional advantage of requiring very little maintenance. However, they can be affected by temperature shifts. Finally, there are belt drive opener models. These replace the metal chain with a rubber or fiberglass belt, which makes for very quiet and smooth operation. Their main downside is that they tend to be more expensive. Modern opener models often come with smart technologically advanced features like rolling security codes, WiFi connectivity and a backup battery. Our experts will be able to advise you on which features best suit your home and your specific needs, and ensure that you don't neglect to consider any of the latest advancements that are available. If you need fast and effective opener repair or need help performing the installation of a new unit, contact our team Garage Door Repair Kaysville and let our technicians assist you with whatever you need.